NYC’s African princess Edoheart just sent us this nu video for experimental drum/synth track Sugar In A Plum from her digital EP Get As E Be. Check it out below and download her poetic voice tracks…p.s. She grew up in Detroit…just like our Editrix Paisley! Edoheart (Eseohe Arhebamen) is an experimental African artist. She was born in Nigeria, raised in Detroit city and is currently living in New York. Edoheart grew up in a family that sang religious songs together. During her teenage years, she gave poetry-slam performances in Detroit that evolved into free-improvisation vocalization soundtracks which incorporated African songs and Edoheart’s poems. After studying butoh dance and touring with the Estonian performance art group, Non Grata, Edoheart’s work was transformed into her Butoh-vocal theatre performances. 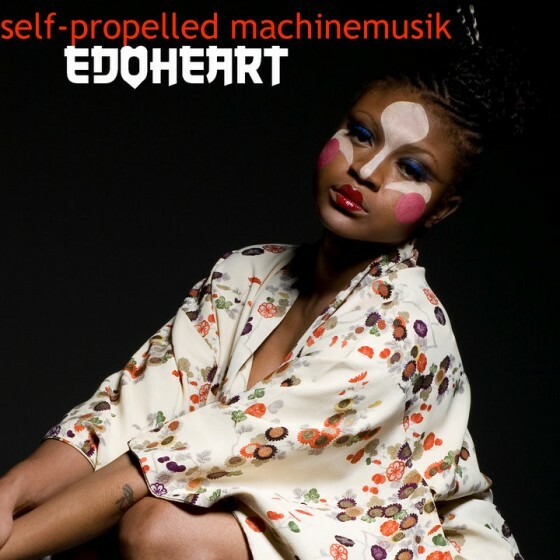 Edoheart’s sound is sometimes African-folk in the spirit of Miriam Makeba but Edoheart also has a noisy, unpredictable side, as in her song “Harmony” which features a wild, free-improvisation vocalization over drum-machine reverb. Edoheart’s performances combine music, dance, visual projections and performance art and have been called “powerful ritual”. Edoheart has been compared to Sun Ra in her performance style. She pairs her folk and avant-garde music with colorful installations and movement rooted in Japanese ankoku-butoh, Nigerian Edo dance theatre and whatever she happens to be interested in at the moment. The idea is to explore all communication! Edoheart performs internationally, has produced several dance-on-film works, and has published two books of poems, winning several awards for her artworks. Her free music single from Clinical Archives was downloaded over 10,000 times in only 3 weeks. As a multimedia artist and a princess of the Edo people, Edoheart’s desire is to create entertaining and edifying experiences that integrate the senses and increase our understanding of the world and ultimately, to radically expand the definition of African arts.